Disclosure Agreement: Cabot provided me with coupons for free cheese to try. We Dish Nutrition tested each product thoroughly and gives high marks to only the very best. Opinions expressed at We Dish Nutrition are our own. Milk, eggs and bread seem to be the storm staples whenever we’re told there is an impending hurricane, earthquake or snowstorm. While those three items can last a family of four enough time for a natural disaster to pass through, I’m an advocate for adding cheese to that list! While eggs are a great source of protein, adding cheese to any meal or snack elevates the flavors in a whole other level! Don’t you agree? With more than 1,200 dairy farm families planted throughout New England and over 1,000 employees, Cabot Cheese would be ready and eager to handle such disasters. Cabot has been partnered with Vermont’s Dakin Farm for ease and convenience, with consumers able to order online. The decisions don’t end there! Cabot cheese products come in bar, slices and shredded form, ready to meet your cooking and snacking needs! Yet, Cabot cows are kept busy, also used to make cottage cheese, butter, yogurt, whipped cream, sour cream, cream cheese and dips! I expect no less from Cabot Farm, providing a variety of flavors and mixtures to its consumers. While I can’t get enough of Cabot’s Muenster cheese, I have put that aside for today to make some lasagna! I decided to shred some of my own Sharp Light Cheddar for today’s meal. I’m impressed with Cabot’s line of “Light cheeses” and with the help of Regan Jones, RD and Sara Wing, RD, Cabot’s present and future products are in good hands! At only 70 calories per one ounce serving, the Sharp Light Cheddar cheese has only 170 mg of sodium and 4.5 g of fat. Yet, the light cheddar’s flavor, thankfully, hasn’t been compromised. It still contains the expectant savory feel of the regular line of cheese, but without the unnecessary fat! 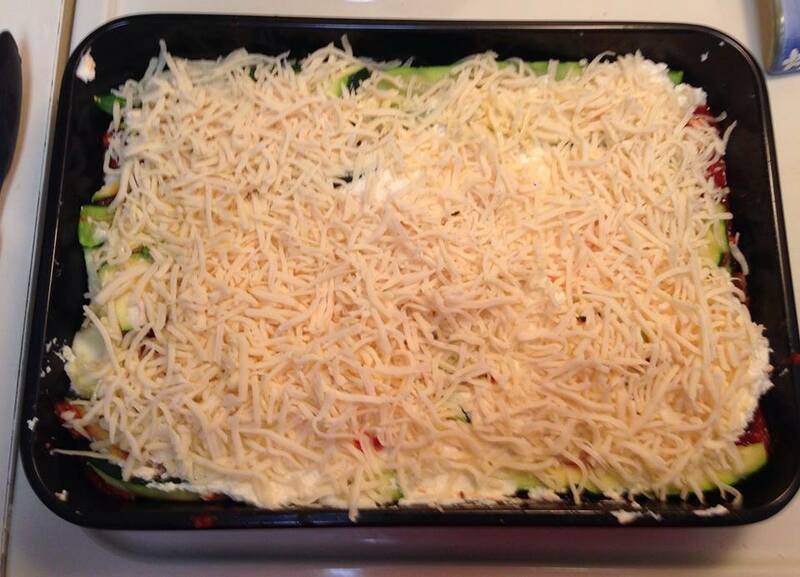 As someone who’s always experimenting with new recipes and ways of making foods healthier, I used sliced zucchini instead of traditional lasagna noodles to add in more vegetables. The mixture of Cabot cheese and tomato juices added the necessary punch! While making lasagna can be time consuming, Cabot has thoroughly provided its consumers with more recipes than one could hope! If you’re in a bind, check out their solutions for 2-Day Suppers, which promotes the use of leftovers as a means get easy family friendly meals on the table! I’ve been having a ball roasting cauliflower for meals, so I can’t wait to try out more of Cabot’s Roasting Veggie recipes! To be frank, I don’t want to overwhelm you with all the resources Cabot has provided its consumers, but when you have the chance, check it all out! Cabot hasn’t missed a beat! Make sure to use their handy guide on how to use Greek yogurt in replacement of sour cream and/or cream cheese, 5 Day Planners, how to add Health Kitchen Helper(s), in the form of your kids and the Brown Bag Builder, providing a step by step guide on how to pack a healthy, delicious lunch! For the lactose intolerance, don’t worry! Cabot’s naturally aged cheese has 0 grams of lactose and shouldn’t cause any lactose intolerance symptoms and/or discomfort. In addition, as a cooperative, Cabot is owned and operated by its members-the family dairy farmers who are the source of Cabot’s dairy products. Cabot reinforces their business philosophy with a Co-op to Co-op Program. Not only does Cabot providing samples of their “World’s Best” cheddar, gift boxes and coupons, but they’re always eager to share the love of cheese with you! Learn how to participate in their cooperative extension today! What’s your favorite way to enjoy Cabot cheese? Have you had your cheese allotment for the day yet? Previous How Sporty Is Your Sport?